Do You Dead-Head Encore Roses? TheGardenLady received this question from John. Are you supposed to cut spent flowers on Encore Roses? Some say you are and others say don’t. Which is correct? Cutting spent flowers is referred to as dead heading. Dead heading is like a minor form of pruning. People do it to most perennial flowers so that the plants look neater and it forces more flowering. So though it is not necessary to deadhead spent roses from my Knock Out Roses, TheGardenLady will cut off the remains of the stem end of the roses that have died, but only for aesthetic reasons. 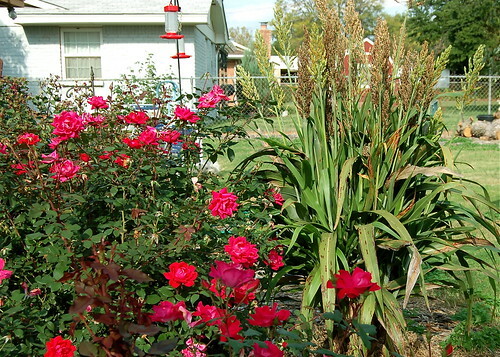 If you’d like to read a previous post on the issue of dead-heading Knock Out Roses, check this post out. I love my knockout’s too! Looking around for the yellow one everyone here in Augusta is talking about. Also, wondering what is the grassy plant in the above picture?